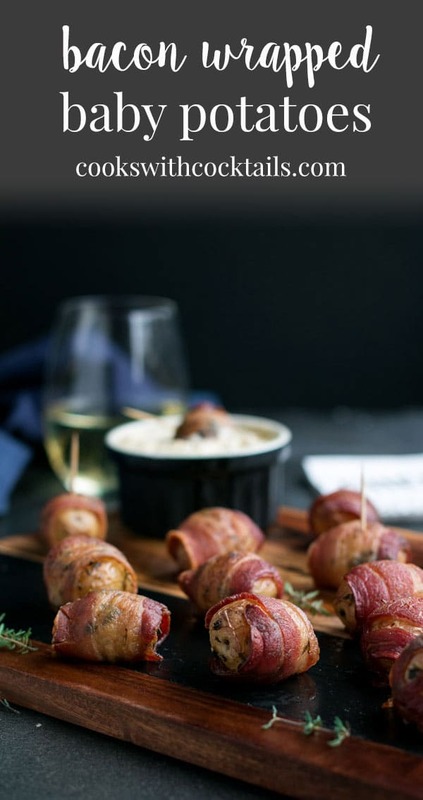 These bacon wrapped potatoes with a warm cream cheese dip are like the appetizer holy grail. They are bite sized yet filling, crispy on the outside but fluffy on the inside, delicious hot or cold and really easy to make! They’re perfect for any party from a backyard bbq to a fancy holiday spread. And the boys are really going to love this one! And with the warm apple cream cheese dip to coat these nuggets in before you pop them in your mouth, they are to die for! Who doesn’t like a cheese dip and this one, with the creamy apple flavor, pairs perfect with the crisp smoky bacon and fluffy baked potatoes. Debbie and I made these for a party at my place the other weekend. They were perfect because people were hungry and also drinking cocktails so we needed some substantial finger food! These tasty little nuggets did the trick. We fully baked the potatoes and bacon ahead of time and then just threw them in the oven to warm them up a little before we put them out. They went fast! We should have made more, but now we know for next time how much people like them! 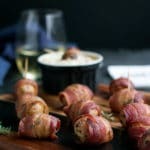 How do you make bacon wrapped potatoes? Wash the baby potatoes. Cut any big ones in half. You want them to be one or two bites big. We used 24 baby potatoes. We used baby potatoes from the Little Potato Company. 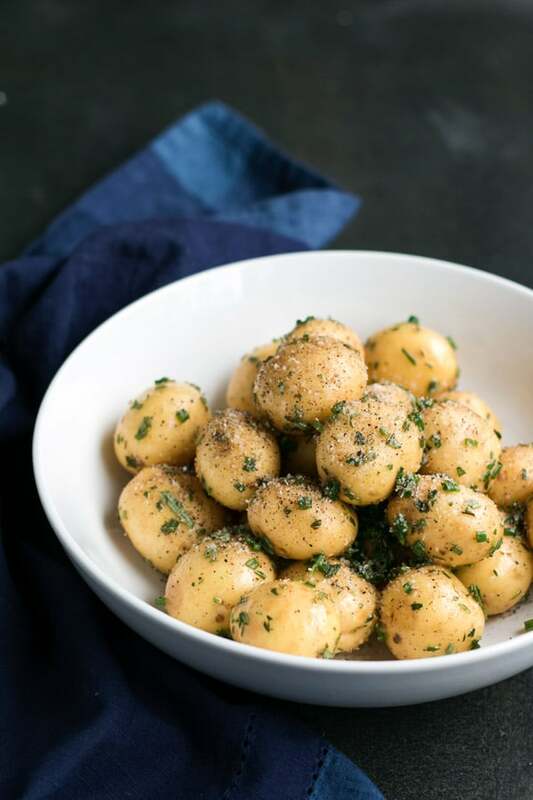 In a bowl, toss the potatoes with a little olive oil to coat them (about 2 tablespoons), about 1/2 teaspoon salt, 1/4 teaspoon pepper, and 1 tablespoon each of chopped fresh thyme, rosemary, and chives. Then simply roll the potatoes in a slice of bacon until covered, then cut the bacon just past where the bacon slice meets the beginning. Place them cut side down on on a baking tray with a rack or parchment paper or silicone mat lined baking tray. You will get about 2 potatoes wrapped with each slice of bacon. Then simply roll the potatoes in a slice of bacon until covered then cut the bacon just past where the bacon slice meets the beginning. Place them cut side down on on a baking tray with a rack or parchment paper or silicone mat lined baking tray. 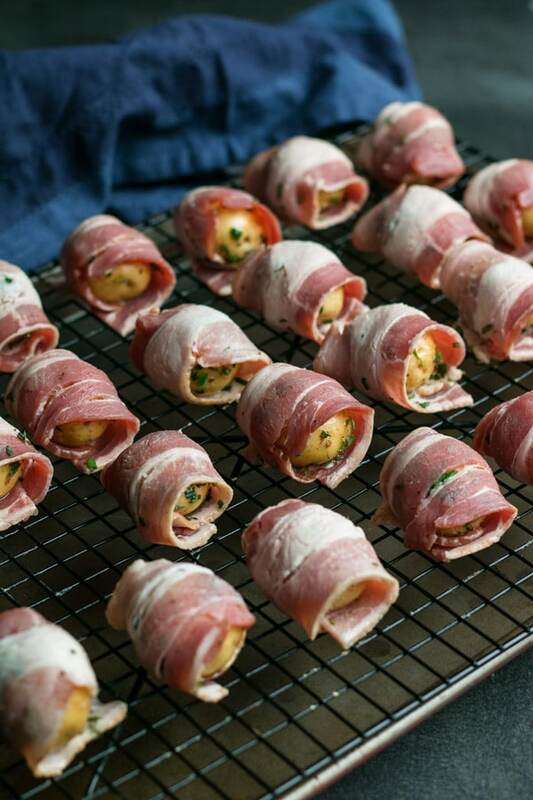 How long do you bake bacon wrapped potatoes? Our potatoes and bacon took about 30 mins at 400 degrees to bake completely. All ovens are a little bit different, but its hard to overcook potatoes so stick with 30 mins if your potatoes are about the size of ours in the pictures. You just want to keep an eye on the bacon to make sure its not getting burnt. If you are using a rack over top of your baking sheet, line your baking sheet with tin foil to catch the grease. This will make clean up a lot easier! As you can see from the picture above, we didn’t do this and we had a greasy mess to clean up. Not that big of a deal though. Cleaning dirty things in the kitchen is the story of our lives… ! Again, if you use a tray over your baking sheet, add some water to the bottom of your tray, otherwise you might have a bit of a smoky situation as the bacon fat starts dripping onto the hot pan. If you use a parchment lined baking sheet, make sure to turn the potatoes over half way through the baking time so the bacon gets crisped everywhere, not just on top. Next time, I think I will use a parchment lined tray just because my oven got quite smoky when the fat dropped. Again, not that big of a deal if you have a fan in your kitchen (which everyone should…), but I’d rather not have the smoke and just have to turn the potatoes over. How do you make the warm cream cheese dip with apples? Take one herb and garlic Boursin cheese round and add it to a bowl with 1/2 cup of whipped cream cheese and 1/2 cup of finely grated gruyere cheese. Grate a whole apple (except the core) and add it to a small skillet on med-low heat with 3 tablespoons of butter. Sprinkle in some cinnamon and nutmeg on top. Saute the apples until they are soft. This will only take about 5 mins. Then turn off the heat, let it cool for a min, and then add it to the cheese. Mix the cheese and the apples all up and then pour it into an oven proof ramekin or small pot. We like heating the cheese dip on the stove top best because its quick, gets nice and gooey, and sometimes in the oven, you can get a crust on the cheese which makes dipping harder. Just make sure you do this over very low heat so the cheese melts gradually and it doesn’t burn. If you heat the cheese dip in the oven, its best to put a cover on it to try to minimize the crust. 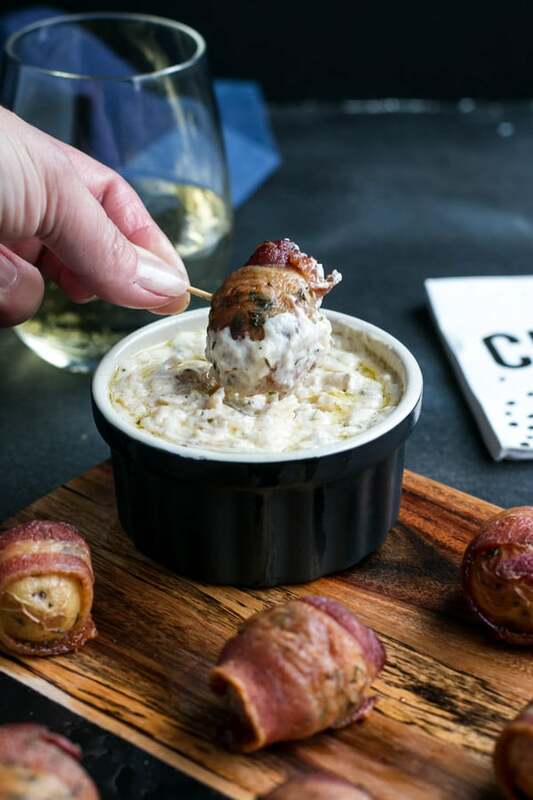 What other dips would be good with these bite sized baked potatoes with bacon? There are tons of options, but these would be our top picks. 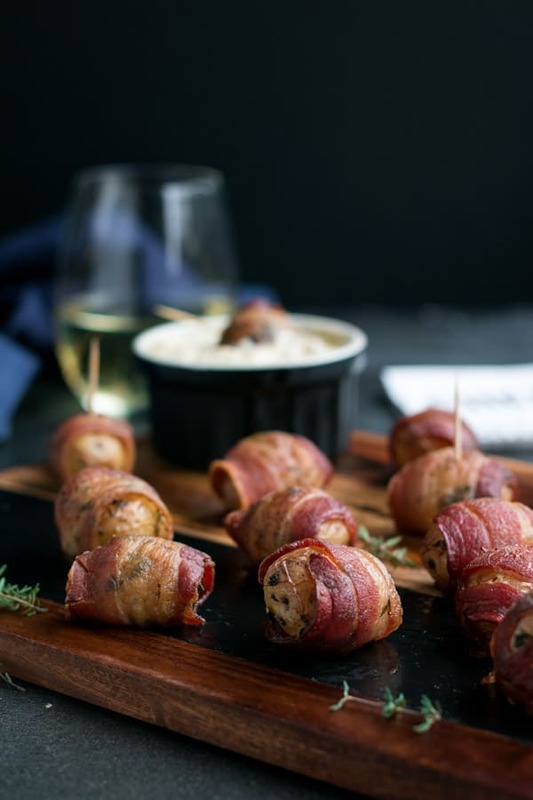 If you’ve tried this bacon wrapped potato recipe then don’t forget to rate the recipe and let us know how it turned out in the comments below. We love hearing from you! 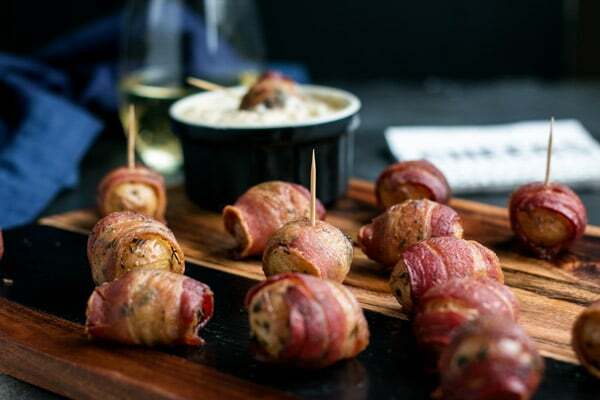 These bacon wrapped potatoes with a warm cream cheese dip are like the appetizer holy grail. They are bite sized yet filling, crispy on the outside but fluffy on the inside, delicious hot or cold and really easy to make! They're perfect for any party from a backyard bbq to a fancy holiday spread. Then simply roll the potatoes in a slice of bacon until covered then cut the bacon just past where the bacon slice meets the beginning. Place them cut side down on on a baking tray with a rack or parchment paper or silicone mat lined baking tray. You will get about 2 potatoes wrapped with each slice of bacon. Our potatoes took about 30 mins at 400 degrees to bake completely. All ovens are a little bit different, but its hard to overcook potatoes so stick with 30 mins if your potatoes are about the size of ours in the pictures. You just want to keep an eye on the bacon to make sure its not getting burnt. Grate a whole apple (except the core) and add it to a small skillet on med-low heat with 3 tablespoons of butter. Sprinkle in some cinnamon and nutmeg on top. Saute the apples until they are soft. This will only take about 5 mins. Then turn off the heat, let it cool for a min, and then add it to the cheese. 1. heat your cheese dip in the oven when you are baking the potatoes. If you do this, its best to put a cover on it to try to minimize getting a crust. 2. heat your cheese dip in the microwave. Do a min at a time, stirring in between. 3. heat your cheese dip on the stove top and then pour into a serving bowl. 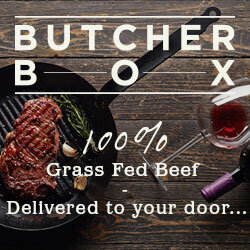 We like this best because its quick, gets nice and gooey. Just make sure you do this over very low heat so the cheese melts gradually and it doesn't burn. Cook just as long as you need to get it all nice and melted. If you are using a rack over top of your baking sheet, line your baking sheet with tin foil to catch the grease. This will make clean up a lot easier! As you can see from the picture above, we didn't do this and we had a greasy mess to clean up. Not that big of a deal though. Cleaning dirty things in the kitchen is the story of our lives... !